Touch 'n Foam Professional 2-Component Spray Foam Kits provide quick and simple solutions to air-sealing projects in residential and commercial buildings. Simply "point, spray and watch" as the foam expands to create an air-tight seal that will not shrink, compress, settle or biodegrade. Easy to use, the Touch n Foam Pro System 15 kit is ideal for smaller projects. It is lightweight and very portable. System 15 2-Component Spray Foam Kit Touch 'n Foam Professional 2-Component Spray Foam Kits provide quick and simple solutions to air-sealing projects in residential and commercial buildings. Simply "point, spray and watch" as the foam expands to create an air-tight seal that will not shrink, compress, settle or biodegrade. Easy to use, the Touch n Foam Pro System 15 kit is ideal for smaller projects. It is lightweight and very portable. System 15 2-Component Spray Foam Kit is rated 2.8 out of 5 by 17. Rated 5 out of 5 by SalJ from Great Product. Works as advertised. I almost didn't buy this product due to the negative reviews. I only needed a small area to be insulated so this kit was perfect. It will cover 15 square ft at 1 inch thickness. I followed the instructions and also watched the tutorials on YouTube. If you need more coverage or you need to be more than 1 inch thick, I would suggest to buy an extra kit or buy the next size up kit. 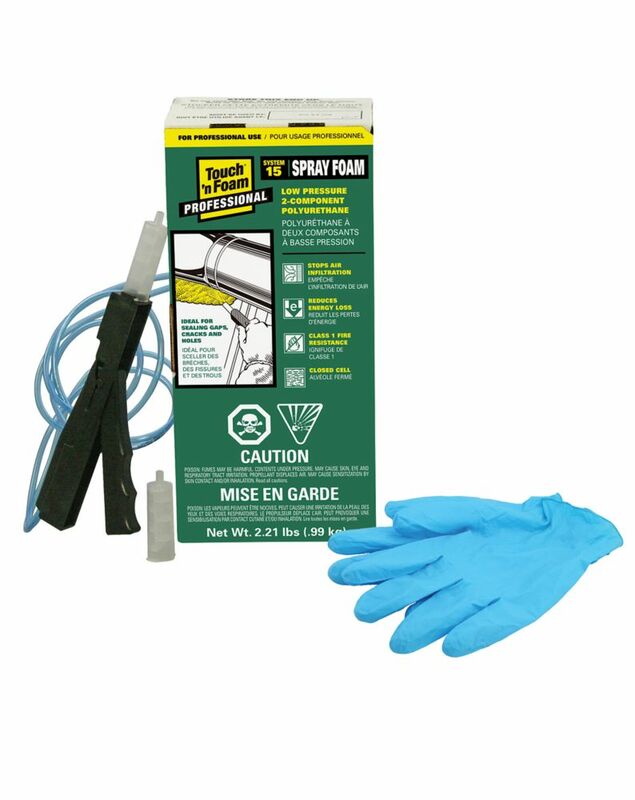 Rated 3 out of 5 by Conti Group from Spray Foam This product claims to cover 15 board feet. At best it will do that but you will have to go back and spray again to cover up any spots that were missed. In order for it to cover the whole area of a basement header it might do 10 to 12 board feet. Very expensive but for small areas it is better than having to pay a insulation company to come in and do it. If you think that you will use more than 5 boxes, buy the next size up. Better value if you need more than 5 of the smaller one. Rated 1 out of 5 by AWD1 from No Coverage I bought this product yesterday, sprays time is very short, surface coverage of this product is much less than indicated on the box. Needed 3 boxes to get any coverage. Would not recommend this product in a small box. Rated 1 out of 5 by JKane from Great for 2 minutes - then can in box spung a leak Was very careful with the setup; box was acclimated to 23decC ... surface was bare lumber boards (about 20degC); well ventilated area etc. Test-sprayed into garbage bag - to ensure clear flow of both chemicals in the tubes. Started laying by picture framing around the stud lumber ... Then 1 can developed a leak - within the box - from what I can tell right at the can/hose connection. Rated 1 out of 5 by diyj from not enough it is simple to use but will only cover an area about 3 feet by 3 feet, if that. there are canisters that seem to contain more for a lot less. Rated 5 out of 5 by wpgcontractor from Works like a charm! Recommendied for sure! I needed to fill a void on my rim joist that my spray foam installer missed. After taking forever for the guy to show up, I decided to do it myself. I was going to use a can of spray foam (great stuff) but I knew that it would work properly because the void was hard to reach. So I decided to go the two piece pro kit. I read some of the review and was reluctant but it was super easy to use. READ THE INSTRUCTIONS and you will be fine! The spray applied like the professional applicator and blends like the expensive spray foam I have in my basement. I would def use it again and recommend it for small touch ups or small jobs. Thank you for your inquiry and for your interest in the DAP Touch &lsquo;n Seal/Touch &lsquo;n Foam products. The Touch &lsquo;n Foam Pro System 15 Kit can be used for the application that you are inquiring about, however, Please be aware that because the two component foam products cure very rapidly, and this kit is only packaged with two application nozzles, the Touch &lsquo;n Foam Pro System 15 Kit is best suited for use in smaller single application projects (not multiple &ldquo;start and stop applications&rdquo;). As indicated on the product package label guidance and supporting product literature: &quot;NOTE: If spraying is stopped for longer than 30 seconds, the foam in the nozzle will begin to cure and clog the nozzle. Replace the used nozzle with a new, unused nozzle.&quot; Should you have any additional questions or would like to discuss other product options, please feel free to reach out to DAP&rsquo;s Technical Customer Service Department at 888-327-8477. We recommend that you hold the spray foam applicator at a 45 degree angle from your body. Think of spray painting. You would not spray directly overhead as some paint would fall on you. Be sure to follow the directions and completely cover all exposed skin and use proper personal protective equipment. The System 15 dispenses a relatively small amount of material and an organic vapor respirator is not recommended unless one is particularly sensitive to chemicals or odors. We do recommend forced air mechanical ventilation to exhaust any airborne substances away from the applicator. Independent third party analytical testing has verified that when DAP two-component spray foam is installed according to manufacturer&rsquo;s directions, including mechanical fresh air cross-ventilation during and for 1 hour post application, no hazardous indoor air quality was detected. Areas sprayed with DAP two-component polyurethane spray foam, adjacent areas and ventilation exhaust areas may be re-occupied 1 hour after foam application. Contact DAP Customer Service at (800)325-6180 for additional information. You can do passes of 1&quot; - 2&quot; in thickness. Allow to cool &quot;to the touch&quot; before applying additional layers. Cooling should only take a few minutes between layers. for the Touch'n'Foam kits, i have a couple questions: i have about 12 sq ft to do at 3-4&quot; thickness. I calculate it at 48 board feet, correct?. Should i use 4 of the 15 kits or 1 of the 200 kit- the 15 kits seem easier to use and more economical. Your calculation is accurate. The System 15 foam kits will be more economical. You might consider whether or not you have other areas in your home(?) that could use additional air sealing and insulation. Areas such as the attic and basements typically have quite a few air leaks that require sealing. If this is the case, you may wish to purchase the System 200. As always, be sure to check with your local authority having jurisdiction prior to beginning any projects. The Touch n Foam System 15 is a &quot;low pressure&quot; spray polyurethane foam system. The Canadian National Building Code only allows &quot;high pressure&quot; spray polyurethane foams for insulation applications. Spray foam &quot;kits&quot; are not allowed by Canadian National Building Codes (CNBC) to be used for insulation. Low pressure spray foam kits can only be used for bead sealing if they are &quot;listed&quot; by the CNBC. The System 15 in &quot;listed/approved&quot; for bead applied air sealing application. To directly answer your questions.. In other countries low pressure spray foam kits are allowed to be applied as insulation (in a thick layer) and as air sealing. The vapor perm rating is 3 @1&quot;, 1.43 @2&quot; and 0.95 @ 3&quot; thickness. The aged r-value is 5.48 per inch. I would like to spray this product to the underside of a roof deck approximately 36 square feet at 4&quot; thick . will this work and how many kits would be required. Hello Tolozarb - Thanks for reaching out to us! In assessing your project needs, we feel the Touch 'n Foam Pro System 15 kit will be too small for this proposed application. The &ldquo;15&rdquo; in the product name, represents &ldquo;ideal output&rdquo; of cured spray polyurethane foam (SPF) in board feet. A board foot is 1 square foot by 1 inch thick. Per your enquiry, you have 36 square feet to cover at a 4&rdquo; thickness. This equates to 36X4= 144 board feet of cured SPF output. We recommend using a Touch N Foam Pro Foam Kit 200. This kit will output, under ideal conditions, 200 board feet of cured SPF and will be much more economical than using roughly 10 foam kit 15&rsquo;s. Please note: SPF is an exothermic product and will heat up as the A/B chemicals mix and are applied to a surface. We recommend that you apply SPF in 1 inch thick layers or lifts, allowing each lift to cool before adding layers. This will not only ensure the safe application of Touch 'n Foam's SPF, it will also help maximize your yield. You're essentially spraying foam through foam when SPF is not allowed to cure in layers. As always, refer to the local authority having jurisdiction to ensure your project will meet appropriate building code requirements. We hope this information is helpful with your project application decision. All the best!